After nearly a decade after Wolf Creek comes the sequel, which has drawn some mixed reaction. The original film for the most part got a passing grade and in my opinion was a terrific feature film debut for Greg McLean. Most of the complaints were it took too long to get started and there wasn’t enough action. McLean could have taken the easy way out and made a film with constant violence and gore with faceless victims. When filmmakers do just that people complain and when they avoid that people still complain. Wolf Creek 2 is more of the film it seemed some people wanted with the original and they get it and yet still complain. Wolf Creek 2 has a bit more action and a lot more gore and characters are in danger pretty much from the start until the end, but its still missing that little something that made the original work so well. However for the good part of its running time Wolf Creek 2 is quite fun and tense at times, but for me the film begins to unravel a bit in the final act, which made me lower my rating as it seems never ending. Outside of the final act Wolf Creek 2 was solid, but far inferior to the original. The plot is more or less the same as the original with Mick Taylor (Jarratt) killing off tourists in the Australian outback. The screenplay was written by Greg McLean & Aaron Sterns and overall its fairly well written in at least as far as sequels go. The script pretty much relies on the original in plot, but it isn’t a carbon copy either. The characters aren’t quite as strong as the original, but in someways they’re equal as well. I for one liked the German tourists and while not very well developed I also liked Paul (Corr) since he accidentally gets caught in the middle. This time around Mick Taylor plays a much larger part and some complained he’s sort of become Freddy Krueger from the later Elm Street films and I’d agree with that. In the original Mick was kind of funny, but in a really creepy way, but here while still a bit creepy he isn’t as chilling and he also gets to be a bit too likable due to the one liners. McLean & Sterns write a fairly strong script that isn’t as light on character development as some have claimed, but in my opinion the script does suffer from many of the flaws often found in sequels. As director Greg McLean crafts a fun and well paced film for the good portion of the running time. Even though there isn’t any action within the first 40 or so minutes in the original there’s something sinister lurking under the surface and that’s something Wolf Creek 2 is lacking despite having a lot more action. The original was very much a throwback to 70s exploitation films whereas Wolf Creek 2 is more in the style of an 80s splatter film. There’s some excellent gore scenes and the first one will no doubt even get a reaction from even the most jaded gore hound. Some of the comedy is out of place (the Kangaroo scene while fairly amusing breaks up the tension) and the tone at times a little silly, but the film is also quite tense in spots and suspenseful. Greg McLean delivers a solid film, but as mentioned I felt the final act was way overly long and Wolf Creek 2 runs out of steam. The cast is quite strong and John Jarratt is again terrific as Mick. While again in my opinion he isn’t quite as chilling here he’s still fairly creepy and Jarratt deserves all the credit he gets for both Wolf Creek films. Overall I liked Wolf Creek 2 and while it isn’t perfect the film is still effective for the most part. 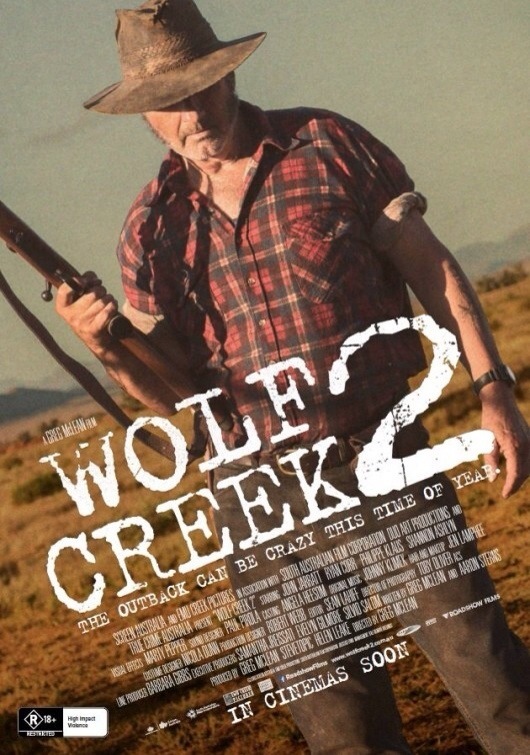 As stated it was the final act that started to lose me, but outside of that while I prefer the original film, Wolf Creek 2 is a worthy follow up.